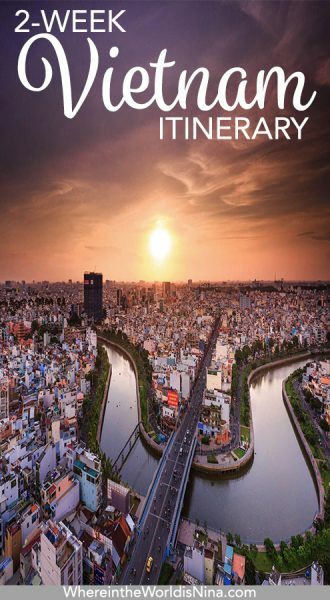 Two weeks in Vietnam might not seem like much time, that’s why you need a carefully curated Vietnam itinerary to hand. Something that will take you to the highlights in a timely fashion but still leave you the occasional evening to chill. The first thing you’ll notice about Vietnam is the green. Rolling hills, terraced rice paddies, and vast swathes of jungle make up most of the country’s landscape. And it is really, really beautiful. Even in the cities, big, leafy trees line the wide boulevards that were built under the French rule. Sure, there are millions of motorbikes zooming in all different directions and honking your horn is a national sport, but all of that is mellowed out by the oases of green. I’ve traveled a lot and this can sometimes make me a little hard to impress. That makes me sound like an entitled jerk but it’s true. Each time I travel I need more to reach that high I had on my first ever trip abroad. But, Vietnam was different. Vietnam blew my mind. I spent virtually the entire time scraping my jaw off the floor as I moved from one region to the next. 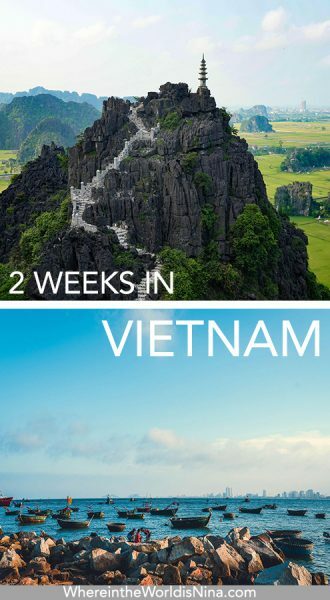 The hardest bit about creating a two-week Vietnam itinerary is deciding which bits of the country you should visit. Honestly, you could spend a year in Vietnam and still have more on your to-do list. It’s that good. So, let’s start in Hanoi, the city’s understated capital, and make our way South on a whirlwind tour of Vietnam’s finest spots. Two weeks in Vietnam isn’t much but it’s enough to take you to some of the country’s (and indeed the world’s) most staggering natural wonders and its pulsing cities. If you weren’t sold on Vietnam when you started reading this post, you will be by the end. 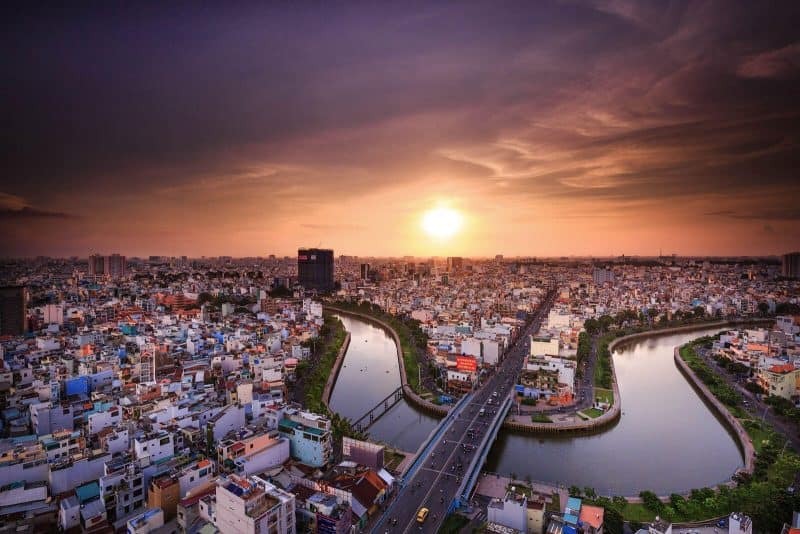 Most people think Ho Chi Minh City is the capital of Vietnam and when you get there you will see why. But, it is actually Hanoi that takes that title. Comparatively quiet and unassuming, the city is brimming with sterling examples of French colonial architecture, as well as a few brasseries and patisseries. Hanoi—Your starting point for your two weeks in Vietnam. Normally, when I read an article that suggests “wandering around the city” as something to do, I think it’s kind of cheating. But, in Hanoi that’s really the best thing to do. Weave through the motorbikes and add Ho Chi Minh’s mausoleum, the Temple of Literature, and Hoan Kiem Lake to your Vietnam itinerary. When hunger strikes, feast on a steaming bowl of pho, a fragrant broth filled with noodles, veggies, and strips of beef. You’ll find pho all over the city, but some of the best is in the night market – which is in itself quite the experience. 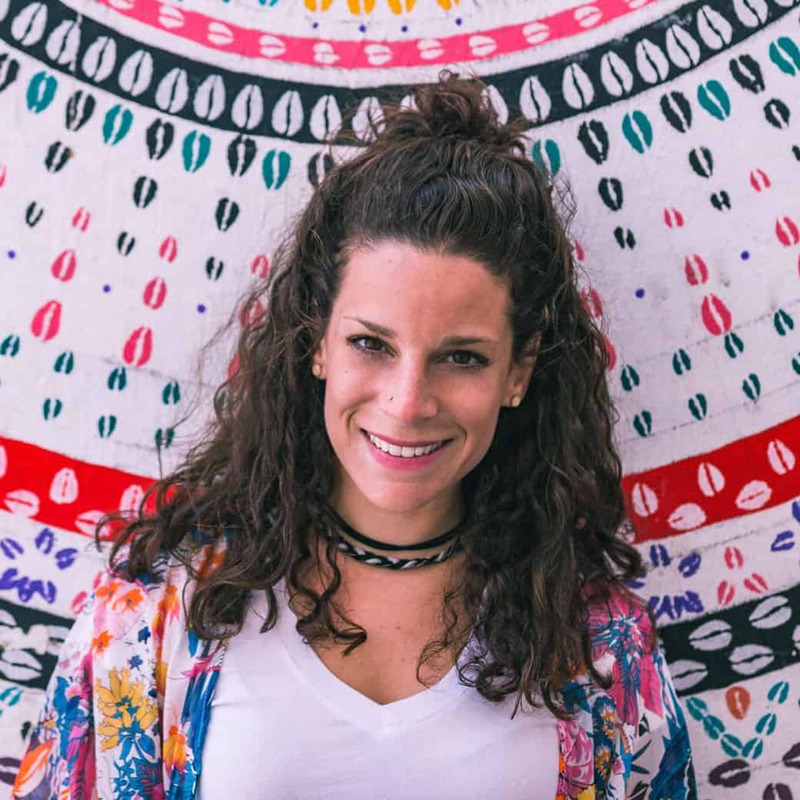 Get your haggling hat on and plunge into a world of vibrant colors, exotic aromas, and so much stuff you never even knew you needed until then. Ha Long Bay is the poster boy for Vietnam. Rarely will you find any promotional material that doesn’t feature the rugged, majestic islands that pepper this bay. Most people take a cruise through the bay to see it in all its glory. I recommend spending 2 days and one night on one of the traditional junkers that ply the water. This is enough time to escape the bulk of the crowds congregated near the harbor and to sail to the more tranquil parts of the bay. The scenery is second to none and there will be a plethora of unmissable Kodak moments so get your camera ready. 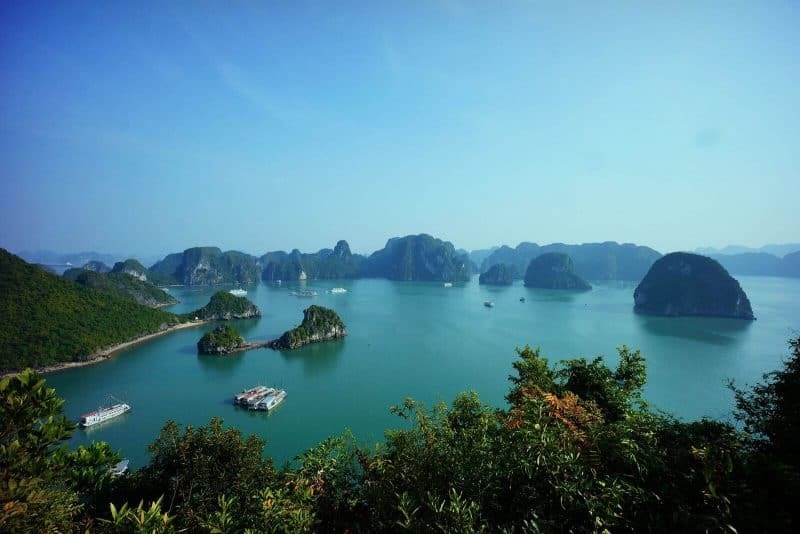 Don’t miss out on Halong Bay, even though it is pretty touristy. Remember, this is Vietnam’s most popular attraction so it will be busy. In fact, it is about as far away from “off the beaten track” as you can get. But, it really is spectacular so don’t leave it off your Vietnam itinerary. I confess, Ninh Binh sounds like a made up name. You also won’t hear it bandied about much on the standard tourist trail. But, it is a real place and it is really worth your time to visit. Imagine immersing yourself in a world of outstanding natural beauty, without the crowds or the vendors hawking tourists. That’s Ninh Binh. I recommend starting in Trang An. Take a boat ride through the underwater caves and enjoy the dazzling, verdant landscapes on either side of the water. Once you’re done, mosey on over to Bai Dinh, the largest pagoda in Southeast Asia. This place is seriously impressive and you can explore the compound from the comfort of a snazzy little electric car. You gotta work for those views! 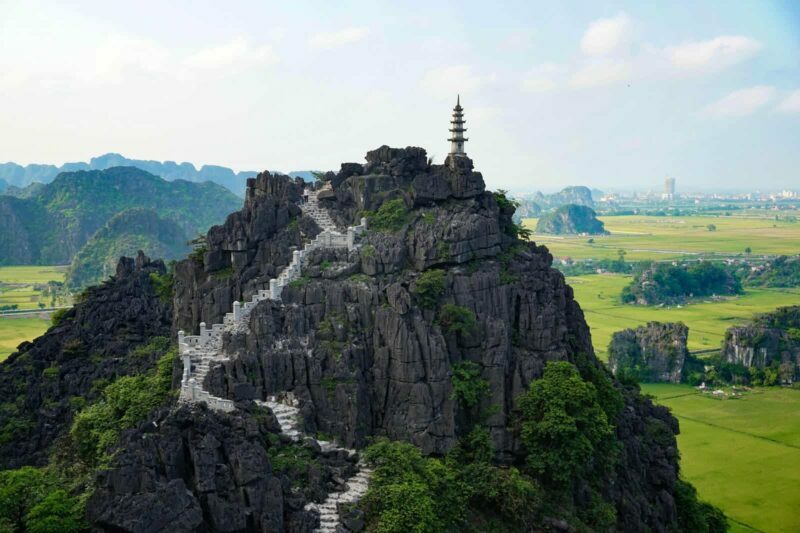 If you’re feeling particularly energetic, climb to the temple at the top of the mountain in Hang Mua. It’s over 500 steps, but well worth the sweat for the panoramic views from the top of the rice paddies and mountains. While I spent most of my time in Vietnam in flip flops, when you get to Ninh Binh, you’re going to want your sneakers. Make sure you pack some adequate hiking gear – or at least some heavy-duty sandals. You will thank yourself when you come home each night with your feet fully intact. So, they’ve just opened a brand new bridge in Da Nang that really deserves your attention. A bridge might not seem like much of a tourist attraction, but this one is. Two gigantic stone hands rise up from the ground and support the Cau Vang (Gold Bridge). The bridge runs for 500ft and offers magnificent vistas of the green hills that roll out in every direction. 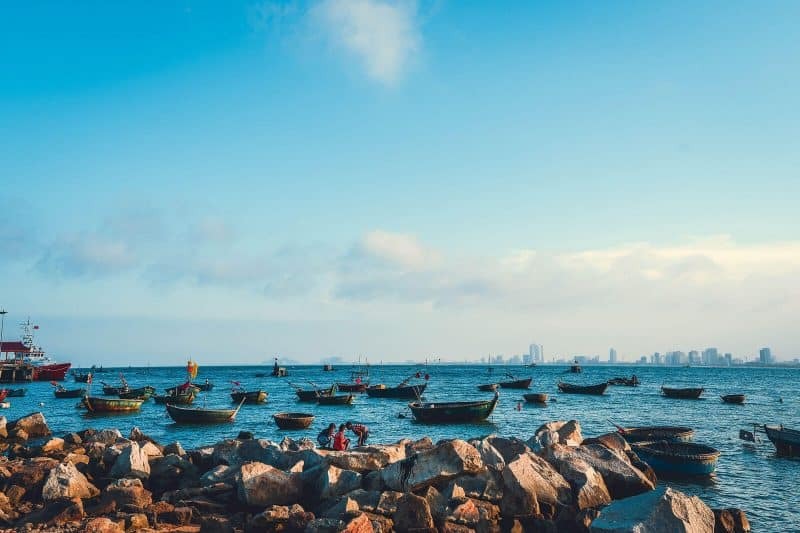 Bridge aside, there is plenty in Da Nang and Hoi An to pack out your Vietnam itinerary. The reason I have chosen to lump them together is because they are side by side. Some people like to set up a base in one and do a day trip to the other (I would recommend this). Or you can move from place to place as you see fit. It’s your call. Thrill seekers might want to hop on a motorbike and scoot along Da Nang’s Hai Van Pass – a mountain pass that runs 13 miles with ocean views the whole way. 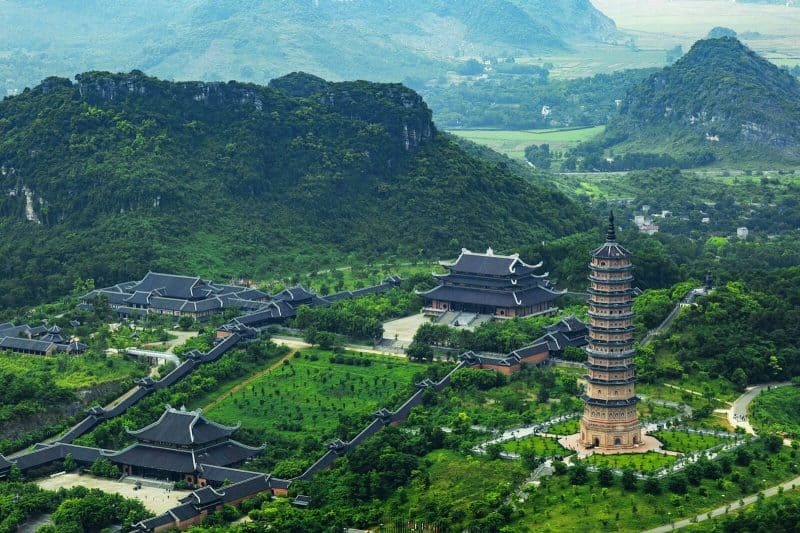 The Marble Mountains are also a star attraction with their various tunnels, caves and Buddhist shrines. Meanwhile, in Hoi An, you’ll find tailors offering to make you the cheapest bespoke suit/dress you’ve ever seen in your life. Just make sure you check it has been double-stitched or it will legit fall apart the first time you wear it. Shop ‘til you drop, then chill out by strolling through the rice paddies and over the gorgeous Japanese Bridge. 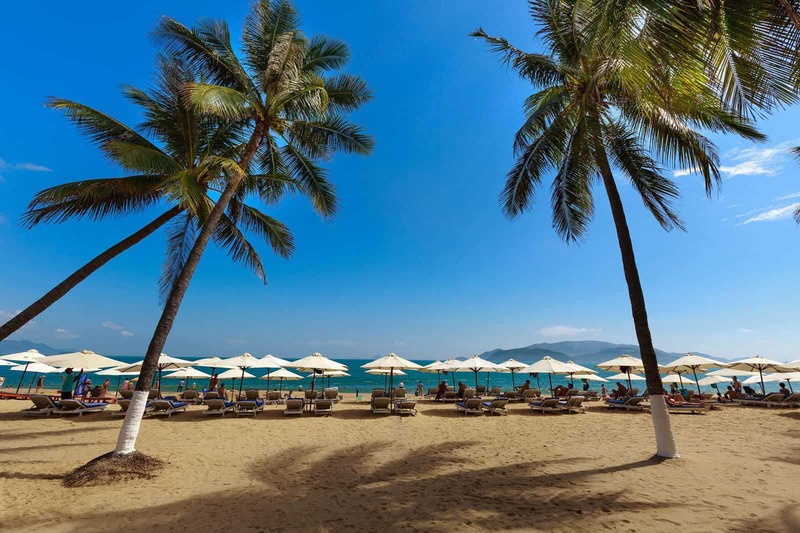 Back in the day, Nha Trang was Vietnam’s hippie haven. You’d find dreadlocked individuals from all over the world soaking up the sunshine with a beer in one hand and a guitar in the other. Now, the hippies are fewer in number while high-rises and resorts dominate the coastline, but some of the town’s old charm remains and you should still visit. For starters, the beaches here are knockouts. White sand, swaying palms – you get the picture. Once you’re in the water, the excitement only increases. Colorful coral reefs make for quality snorkeling and scuba sessions, particularly in the Hon Mun Marine Protected Area. Grab a snorkel and explore or just chill. Either are acceptable ways to spend your time here. If you’re looking for something a little different during your two weeks in Vietnam, your whistle stop Nha Trang tour wouldn’t be complete without a trip to the mud baths. There are mud baths all over the city and they are filled with muddy mineral goodness that leaves your skin feeling baby smooth. Even if your skin is already silky smooth, do it for the highly entertaining photos of your mud-covered friends. Depending on what kind of person you are, you might want to spend a day at Vinpearl, Vietnam’s number one theme park. I’m a big kid at heart and absolutely loved it, but it’s not exactly an authentic Vietnamese experience. But, there are some rides and waterslides here that could put Orlando to shame. It could be a fun little addition to your Vietnam itinerary if you’re into that kind of thing. We have finally made it to Ho Chi Minh City, the beating heart of Vietnam and the final stop of your Vietnam itinerary. Unlike Hanoi, Ho Chi Minh City has high-rise business districts and multi-lane highways. In other words, it feels like a big, bustling city. But, like Hanoi, it is filled with history that is deeply rooted in Vietnam’s cultural heritage. 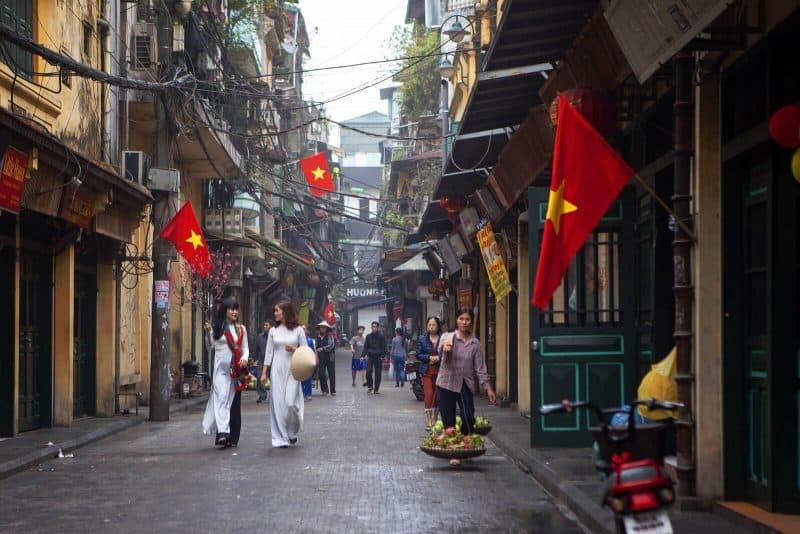 Wandering through the streets you’ll see remnants of the French colonial rule; scars from the Vietnam war; and traditional markets that have existed for centuries. Ho Chi Minh’s sunset vibes. The city itself is an exciting place, but perhaps even more interesting are the natural wonders found on its outskirts. The Mekong Delta, a labyrinth of rivers, swamps, and islands, can be experienced in a day trip. Hop in a boat, cruise leisurely along the water, and enjoy the lush, green scenery. The Giang Dien Waterfalls also make an excellent day trip. You can take a dip near the waterfalls and hike through the surrounding park. It’s a picturesque and peaceful antidote to the city if you’re finding it overwhelming. Well, that’s all folks. We just raced through Vietnam in a mere fortnight. Like I said before, two weeks in Vietnam barely scratches the surface. But, if you’re on a vacation with time constraints then this itinerary will be a godsend. You’ll see the best bits and you’ll never have a dull moment, I promise. Click the picture and pin it for later! Thanks for the blog it’s awesome! Did you rent a vehicle while you traveled through Vietnam or did you bus?